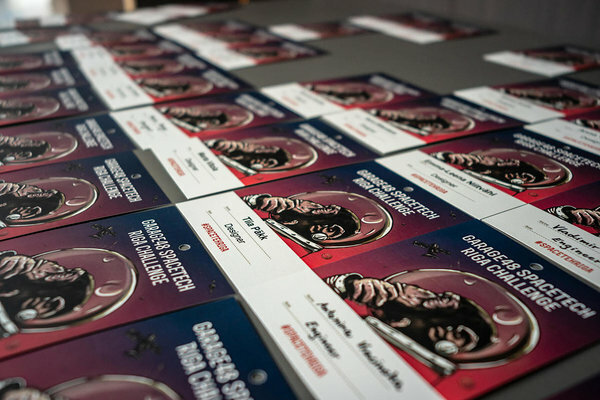 The first Garage48 SpaceTech hackathon in Riga has taken off the ground! 9 amazing teams have started to work to realise their ideas. We heard 16 presentations ranging from artistic visualisation of space to vertical takeoff and landing assistance. Now they have only 48 hours to finish their idea and create a prototype to present to the judges and the whole world. Garage48 SpaceTech Riga Challenge is organised by Garage48, sTARTUp HUB, Heliocentric Technologies Latvia and Green and Smart Technology Cluster as a part of the European Regional Development Fund Interreg Estonia-Latvia SpaceTEM project. ,,The primary goal of the SpaceTEM project is to train the next generation of space and high technology entrepreneurs in Estonia and Latvia using hands-on methods,” comments Karoli Kahn, the representative of the project lead partner University of Tartu. This is the third the Garage48 SpaceTech, but the first time for it to come to Riga. ,,Latvians have had a staggering presence in Garage48 space tech & hardware hackathons, so it's obvious for Garage48 to continue this event series here and let the Estonians hop the bus and join in. Being a small country we've been punching above the weight from building nanosatellites, to full-blown rockets (albeit low altitude ones) to big data solutions that make great use of geospatial data. Fun fact that I discovered last week - Latvian State Forestry company has built one of the most advanced Geospatial IT systems for their industry in the world. I trust we have all the right minds and tools to build more of such things,” says Krists Avots, long-time Garage48 team member, moderator and mentor of this event. We are very happy to be here and looking forward to see all of the fantastic ideas on Sunday. 1. WRVMUSAAI.LY- Water reservoir volume monitoring using satellite altimetry imagery - Tracks bodies of water and compares it to historical data to give an accurate overview of the water left in the reservoirs or natural bodies of water. 2. VTOL- vertical takeoff and landing scheme that would be up to 30% more accurate than the current drones in assistance of takeoff and landing. The prototype will be shaped like wings and will generate lift. 3. Forest Sentinel- Idea is to provide an alternative to manual forest monitoring using ML system to recognise tree species, height, age etc. From sentinel satellite imagery and LVM provided data a program will be created that will make valuation of the forests more accurate and faster. 4. Creative Space- art is a way to introduce space to groups that so far have not been so interested in space. Idea is to come up with ideas that will include artistic visualisation of space and to promote these to different interest groups. 5. 5€ to Mars- to introduce a crowdfunding platform for people to contribute money to mars colonisation. The money would be given to research and developing programs that are trying to reach and colonise Mars. 6. SatData- One space, one economy, a shared economy for space data- create a marketplace for finding resources, sharing existing resources and creating value added services for others to use. 7. Rocket launcher- You will be able to launch a rocket over wifi. One small box that can be added to your rocket and launch away! If anyone has a rocket then this will be very useful and yes, you can launch your neighbours rocket as well. 8. Time capsule- Time capsule that will be launched to space with a timer and then after the time runs out the thrusters will start working and the capsule will be sent back to earth and will hopefully land on the same continent. Will send out a GPS signal with it’s location. 9. One way ticket to space- you can go to space and die there. Wifi will be included so you can post your last moment on Facebook and be immortalised by flying in space like the Tesla roadster. The ideas that were not realised this time, but were great as well. 10. Spectrometer in space- a cheap spectrometer that will work in space and it’s possible usage in space. 11. MAPS- positioning in a forest using map of trees. Because of the trees locationing is difficult in the forest and using recreated images of surrounding trees to locate people in the forest more easily and faster than with a regular GPS. 12. Precise trees- Mapping the forest and positioning of the trees is difficult when there is no coverage. The idea is to tag the trees somehow and when you reach a location with internet the data will be forwarded to wherever you need. 14. Astronaut workout- Have you ever dreamed about becoming an astronaut? This gadget that will help to count all workouts on your way to becoming an astronaut. From running to pushups and anything else that will help you become healthier by tracking whatever you choose to do as a sport. 15. Virtual Space training- If you have a ticket to space then you don’t have the the overview of what are the risks. The idea is to create a VR to introduce you to the danger of space and tell you what to do in case of emergency. 16. Time machine for satellite images- Idea is to show you what has been in place of your future pice of land or any other interesting place. You will get to see how the landscape has changed and if the area does actually get flooded during the spring or not and not depend on the word of the salesman.